Archaeologists often identify features in the field by carefully observing irregularities in soils, artifact concentrations, and rock concentration. For example, CART first identified Feature 5 as a change in soil color below the plow zone. Feature 5 soil differed from that of the surrounding subsoil generally encountered on this area of the site. 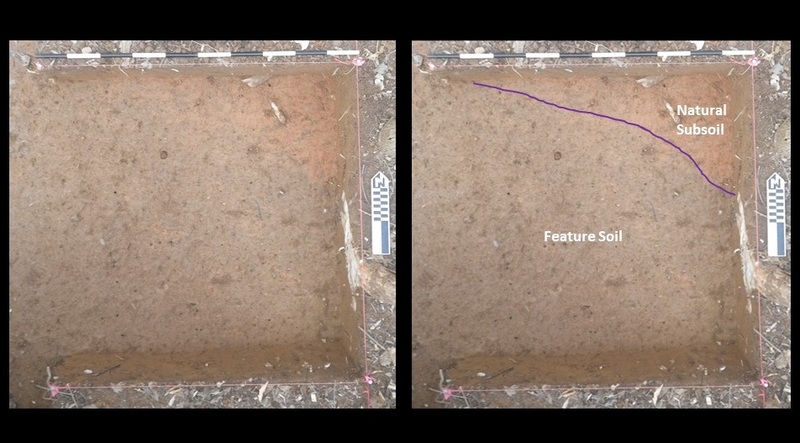 In addition to the soil difference, archaeologists observed a distinct line separating the feature soil from the subsoil. The clear difference further indicated that the soil likely represented a feature. The picture below shows the separation of the subsoil from the feature soil. The corner of the test unit pictured below revealed a redder soil than the remainder of the unit, the redder soil is the subsoil and the feature is located in the rest of the unit. The purple line in the photograph on the right highlights the separation of feature soil and subsoil.